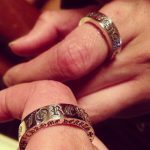 Home » Blog » How to test your Chrome Hearts jewellery. 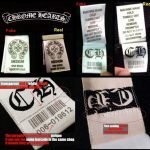 A simple and easy to understand guide to buying Chrome Hearts silver accessories.There is an enormous distinction between silver-plated and sterling silver items.This can not only save you hundreds of dollars in wasted money spent on accessories. Silver plate is the method of bonding an extremely thin layer (measured in microns) of silver to a base metal; most commonly used are copper, brass, white metal, or nickel. This layer of silver is so thin and nearly impossible to recover from the item without expensive means and is not worth the cost of recovery due to the small amount of silver that can be recovered. Silver plated flatware and hollow ware are very common, and very inexpensive, with the exception of rare or limited production items, and items made by well-known and respected manufacturers. If your item has EP, EPNS, Silver on Copper, or other terms marked on it, then it is electroplated silver, it is not sterling. EPNS stands for electroplated nickel silver. Manufacturers are not allowed to use the word “Sterling” on plated items, so you will never see the term “Sterling Plated”. However, some unscrupulous sellers, especially on Television ads, will use the term “Layered in Precious Sterling Silver”. This is an advertising ploy used to get you to buy their product, thinking it is Sterling Silver. It is not Sterling! It is simple to silver-plate. One of those ads that come to mind is the Prayer Cross that is advertised constantly. This item is a cheap plated cross and contains no sterling whatsoever. As copper prices continue to rise, it may be wise to buy silverplated copper items in order to scrap and sell the copper, which is far more valuable than the silver plating on the item. If you suspect an item is sterling, it will mark somewhere. You may need a magnifier or jeweller’s loupe to find the mark, but it will be there if it is Sterling. If there is no mark, then it is NOT Sterling. Don’t list it as Sterling unless you know for sure it is Sterling Silver. Vermeil is sterling silver with a gold plating. Again, there are some differences between gold plating, and real, quality vermeil. Real Vermeil is sterling silver with real gold bonded to the sterling, and it is usually quite thick. It is not electroplated but layered and bonded to the sterling. Good quality vermeil will last a lifetime, meaning the gold will not wear off. It is the type of jewellery you can hand down to generations. You will usually pay a little more for vermeil than plain sterling, but you know you are getting real sterling, and not a thin, gold plated copper item. Vermeil jewellery is good quality and worth looking at for investment. Vermeil is also always marked as .925 or Sterling. Sterling silver is 92.5% pure silver, which is why it is so much more expensive than plated items. Sterling silver can be melted and the pure silver recovered rather inexpensively. Sterling silver is traded in troy ounces, a troy ounce is equal to 31.2 grams. A troy pound consists of 12 troy ounces. If you list your sterling you should state the weight of the item as accurately as possible, as most collectors determine the price they are willing to pay by the market value of silver on any given day. When you purchase silver bars or silver rounds, they are marked .999 fine silver, and this is the foundation for the trading value. The market value of silver is based on .999 or 99% fine silver, NOT sterling. Do not give a melt value of your sterling in the listing unless you have done the math correctly. 1 troy ounce of sterling silver = 31.2 grams X .925 or 28.86 grams of pure silver. If silver is trading today for $17 per troy ounce, then 1 ounce of sterling has a melt value of $15.72, NOT $17. Furthermore, that value is applicable only if you melt the silver yourself. A foundry or smelter will charge you to melt your silver and assay the pure content, generally, this can be from 12%-20% of the pure weight after melting and assaying. American made Sterling silver is always marked Sterling or 925. There are no exceptions to this rule. Period! Colonial sterling from the 1700’s may contain English hallmarks, but nonetheless, will be marked. Especially British sterling is hallmarked. Hallmarks are made with a die, that is stamped directly into the piece. Most British hallmarks consist of at least 3 marks, the first one being the city of manufacture, denoted by a leopard head, anchor, or another mark. The second mark is the purity mark, denoted by a Lion Passant, which is a standing lion with a paw raised. The lion mark indicates a purity of 92.5% or higher, this is the standard for sterling. The third mark consists of a single letter, which is a code for the year of manufacture. All the various hallmarks are now available online from many different websites. If you do a google search for English silver hallmarks, you will find many references that will help you identify where and when your item was made. European or Continental silver is generally not Sterling silver, according to the standard of .925. Germany’s standard is .800, which is substantially lower in pure silver content. It is only 80% pure. Russian silver is usually marked .840 or 87.5% pure. France’s standard is .950, which is higher in purity than the sterling standard of .925. French silver is also hallmarked and stamped .950 or has a hallmark of a head of Minerva, indicative of 95% pure. Italian sterling is generally .925, though some older silver from Italy is marked 800 pure. There are a few countries that make sterling silver jewelry and other items that do not mark the items. India and Bali are two that come to mind, and I’m sure there are others. Remember that the International Laws regarding purity hallmarks do not apply to local craftsman, small businesses, and private jewelers that create and sell their own goods. Once you know your silver, you should be able to look at a piece and immediately be able to tell if it is sterling or not. If in doubt, have it checked with the acid test! There are 2 common ways to accurately test silver. The most common and oldest method is the acid test. This is done by taking a sample filing from your item and applying acid to it. Sterling and pure silver will not change the color of the acid, which is usually red. If the acid turns brown or changes color, then the item is not Sterling. It may have some silver content, but it is not the Sterling standard. If you attempt to test your items yourself, make sure you take a sample from well below the silver-plate. Silver-plate will show a positive test for silver if you apply acid directly on to it. You must make a deep groove in the piece so you are below the plating before you can apply your acid. This is the most accurate way to test silver by yourself, as this is the method most jewelers use. However, I have had jewellers tell me an item was sterling, when it was not. Use a reputable jeweller and get their test results in writing. If they refuse to give you their test result in writing, find another jeweller. If they are doing the test correctly, they should not hesitate to certify their results. You may also use a testing stone to perform this test, as it will not leave a dull mark on the piece you are testing. In order to use a testing stone correctly, you must scratch the piece on the stone, and again, make sure you scratch deep enough below the surface to get an accurate test. You must also be sure you are using fresh acid. The acid that is over 9 months old will deteriorate and will not give you a correct test, even on pure silver. Buy fresh acid from a reputable dealer. The second method of testing is to send your item to a foundry or smelter. While they will absolutely be able to determine the purity of the silver in your item, it may also need to be damaged or melted to get an accurate assay. This method is usually used when you are scrapping silver and wish to have it destroyed for the monetary value. Sterling silver items are usually a much better workmanship and quality than silver plated items. Look for clean, rolled edges on trays, hollow ware, and goblets. The crispness of the design is another indication sometimes, as well used sterling will wear and lose its design. But silver plate will wear off before the design wears away, exposing the base metal. With extremely few exceptions, Sterling silver is ALWAYS, ALWAYS, marked. If you suspect an item is sterling, but cannot find the mark that says sterling, or 925, or English hallmarks, then it is definitely NOT Sterling. The sterling standard has been around for centuries, and if you are lucky enough to find a piece of silver that is 500 years old and unmarked, then you might have an extremely expensive antique. But that is hardly the rule. The rule is “If it isn’t marked, it isn’t sterling”. Don’t buy it, and most importantly, don’t sell it as Sterling. There are laws that prohibit selling an item by misrepresenting, or incorrectly identifying the content. If you list an item as sterling, and it is not sterling, you may be subject to a lawsuit. If you don’t accept returns or give refunds due to your mistake, you may end up in court. This is commonly called FRAUD. There are laws in every state that prohibit the selling of anything that is misrepresented. Make sure you know what you have and you list your silver plated or sterling items in the correct category and state in your listing exactly what your item is made of. visible deposit, preferably a line 1″–11/2″ long. the finish and leave a mark where the acid was placed.